DOES ANY OF THIS MAKE YOU SMILE UNCONTROLABLY? Halloween, Christmas, babies and animals playing together, Murphy’s Law phrases (or the kind)…yep, can’t help myself – I have to smile at these types of things. Any baby animals doing anything usually does it too. When things are at their worst, what do you find to pull you out of it? I have found many quick and simple things to do or see that help me change a feeling or attitude. 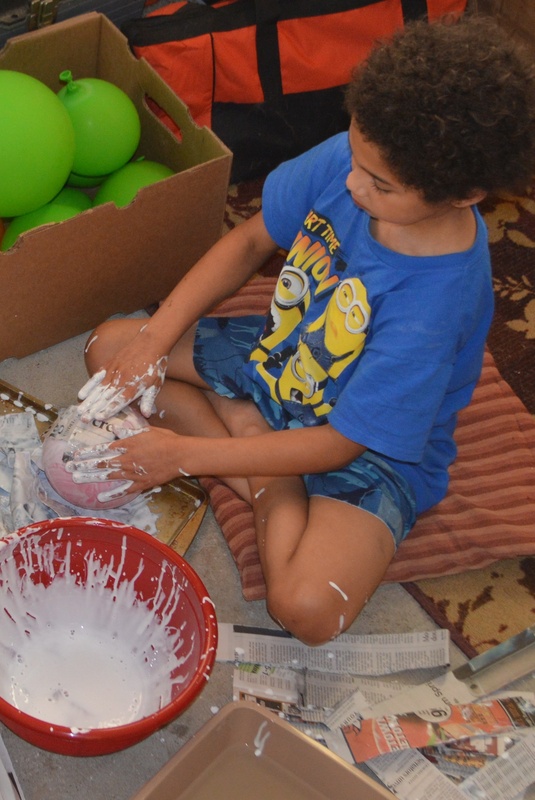 My grandson and I worked on making a mess – oh wait, I mean making papier Mache’ pumpkins (ok – it was a mess too!) – WHAT FUN!! We (mostly him) had glue all over us, bits of sticky newspaper stuck on us, and it ended up on places I didn’t know of until I showered (turns very white in the shower). My sister got pics of us so I could see the mess! I am getting a ton of helpful emails from my fav DIY and crafting sites to help inspire me into amazing things. Unfortunately, with all of my replacement parts I am only able to do some of the fun ideas – but I also have help! My sister is a Godsend when it comes to me and my ideas! She is very helpful and supportive (even if I have to beat it into her – not!! LOL) with most of the ideas I come up with. If any of you watch any TV, you may be a DIY/Homemade/Crafty fanatic like me? I can’t get enough of the stuff and this year is already starting out with a bang! Home and Family TV on the Hallmark Channel has started doing up their home for the Halloween holiday. They built a type of “crypt” (they called it that, looked like a mini castle tunnel to me?) and I thought, why not take just the front part of it and rig it to our new porch? They used simple enough supplies, just may work. I mentioned this to my sister and she shot me the evil eye look. That’s usually passed to me when she thinks I’m out of my gourd – oh well! So, my task is to gather a list of materials together (oh, oh, another trip to Home Depot – dun, dun, daaa!) get stuff cut and painted, then see if I can coax her up on the ladder to complete my idea. See now, I have not even started this project yet, but I got myself to smile just thinking about it! Hee hee – hope you did too! ← HOW DID I GET THROUGH THE LOSSES OF 2014?